A delightful surprise today when a friend rang to say that she had seen a poster for a musical play of one of my Dad’s books! The Fate of Jeremy Visick is to be performed in a couple of weeks and of course, we now have tickets. The book was first adapted by Judith Cook and we all came down from Yorkshire to see the Premiere at The Barbican Theatre in Plymouth in 1990! It is so lovely to know that my Dad’s work is still being appreciated. We love the poster and think Dad would have approved. Thirteen singers from my two choirs met at the building site that is The Hall for Cornwall to entertain the dignitaries who were being shown around. We sang in the stair-well and the acoustics were brilliant. The audience in their hard hats and hi-vis jackets were very appreciative. In the process of the building works, a beautiful gate has been discovered. It was buried inside a wall and dates from before 1914 so is well over 100 years old. The plans have been altered a little to make sure this discovery is integrated into the new building. Pink skies greeted us this morning. I wore my best scarf this morning to say goodbye to one of our choir members. Black and red are The Ingleheart Singers’ colours. As always, top of my list – be kind. Both my choirs collect for charities at our gigs and one we have supported this year has been ShelterBox. Click on the red link to find out what they do and to hear more of what they do, you can watch their Facebook Live that went out today. Some of The Ingleheart Singers came this afternoon for a tour and to hear what the charity does, to give them our contribution and to sing live! Check it out here and take a look around the gallery. If you would like to read other posts I have written about this splendid charity, put ShelterBox into my search and several posts will come up. A delicate white feather became caught on the seed pods of a Crocosmia. Lady Betty Balfour Clematis is one of my favourites. It is flowering rather early this year as it is supposed to bloom in September. A number of The Ingleheart Singers have been to meet the two Welsh choirs who are visiting us from Port Talbot for our Grand Annual Concert tomorrow. As I was leaving the car park of their hotel, I noticed the sunset reflection in their coach window above the magnificent Welsh Dragon. It has been very Autumnal in the garden today and I noticed several spiders busy in their webs. This was the only successful photo though as they were constantly on the move. A frog has turned up in a tub of water on the patio. There are stones there so he can get out but I am hoping he is okay. The new singing term started with The Inglehearts tonight and was such a joy. We have all missed our session. Tonight we learned a new song for World Peace Day on 21st September when we will be performing in Truro. Nation will not lift up sword against nation, nor will they learn war any more. It is less than two weeks to the start of our production of ‘Until the Day Break’! Today was a choir rehearsal with The Ingleheart Singers and The Red River Singers for the whole route, planning who should sing where – very exciting! There were small character rehearsals going on too so here is a gallery to give you a flavour of our beautiful afternoon. Click on any photo for more detail. 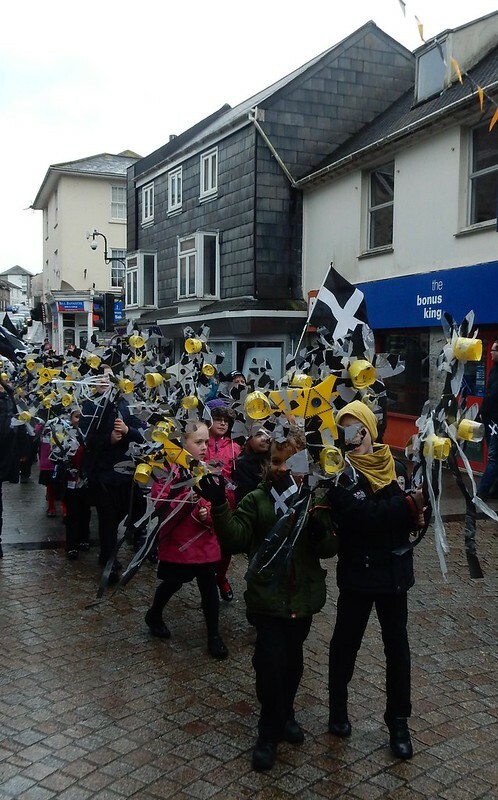 St Piran’s day is tomorrow and there have been parades all over Cornwall today. 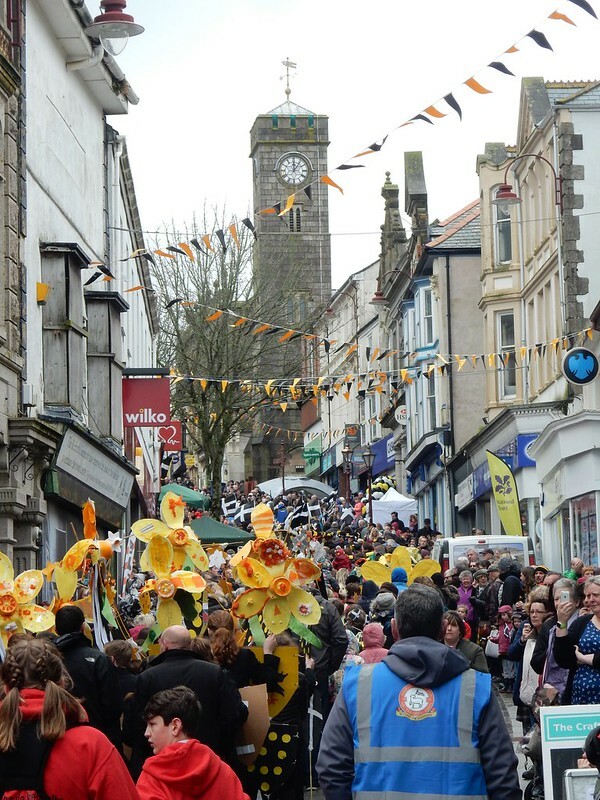 In Redruth, the rain held off just for the duration of the parade. The theme is both St Piran represented by his flag, black with a white cross, and daffodils. Every local school takes part and the whole event is one of joy. 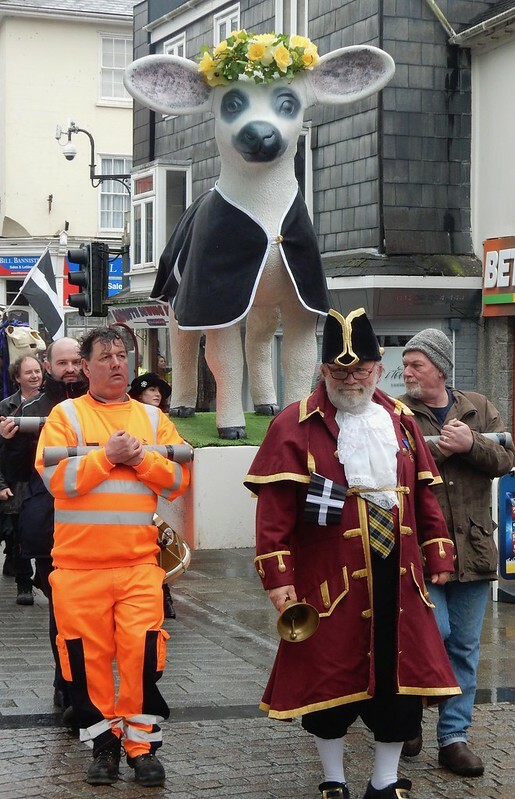 The start of the Parade with Redruth’s mascot, Tolgus the Lamb leading. 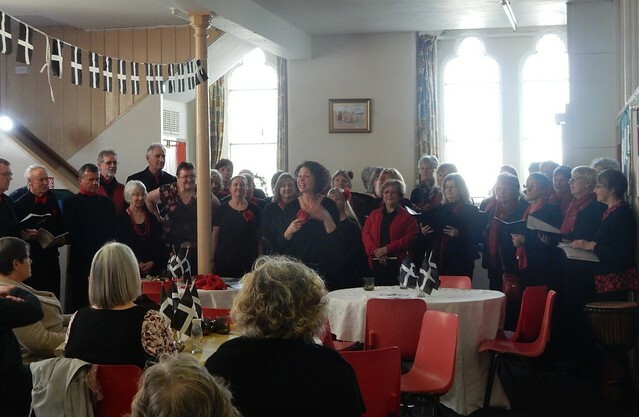 As part of the celebrations, my choir had been asked to sing Cornish songs and though the audience was quite small they were very enthusiastic. 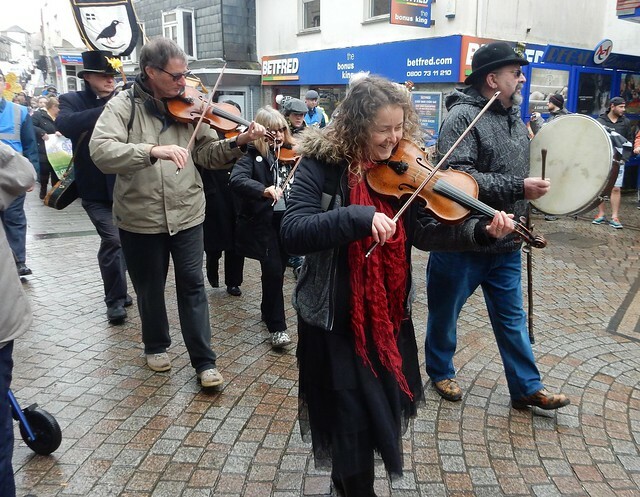 I had to leave the performance early to catch the train to Truro, a train it turned out, which was full of people coming up from Penzance to the Save Our NHS March. 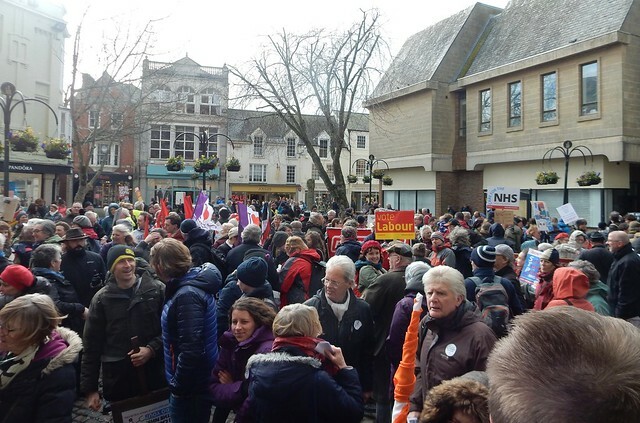 There were tens of thousands marching in London and several hundred of us in Truro. This photo was taken at the end as the crowd is beginning to leave.